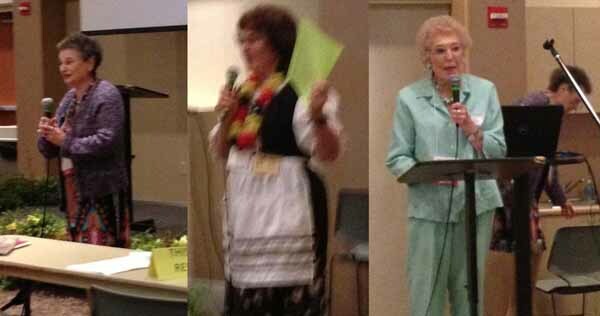 The 2013 seminar took place May 4th at the Fair Oaks Presbyterian Church. 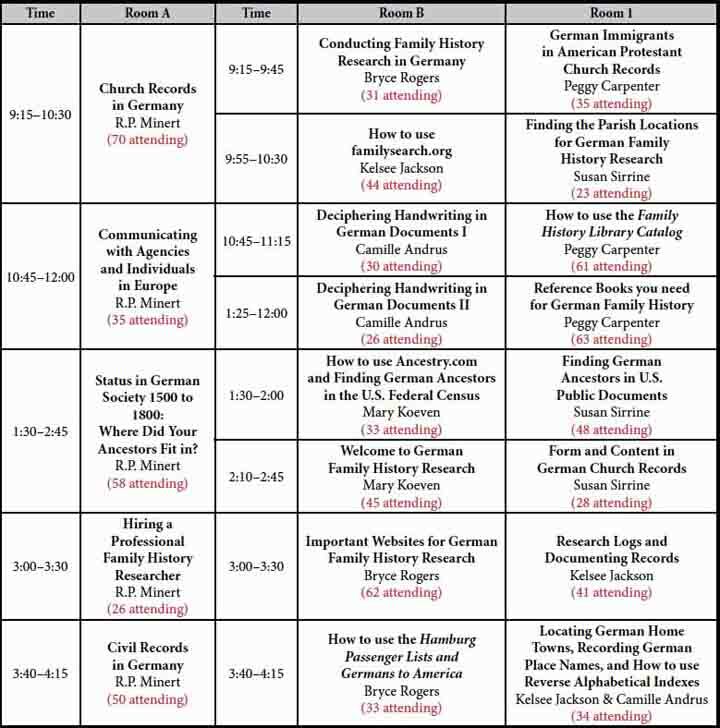 Titled 'My German Roots' A Festival for German Genealogists, Dr. Roger P. Minert and six of his colleagues from Brigham Young University presented three tracks of lectures and conducted free individual consultations. Colleagues accompanying Dr. Minert were Bryce Rogers, Camille Andrus, Kelsee Jackson, Mary Koeven, Peggy Carpenter and Susan Sirrine. 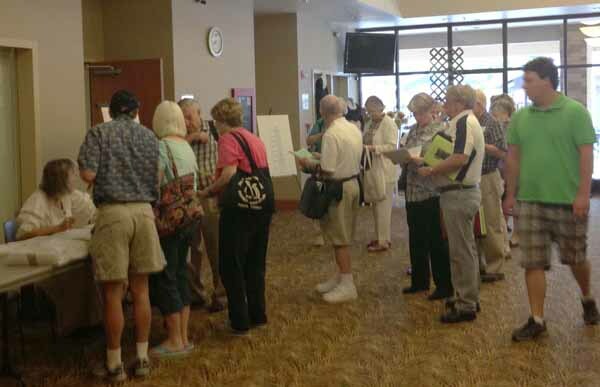 Fair Oaks Presbyterian Church – a new facility for SGGS seminars. 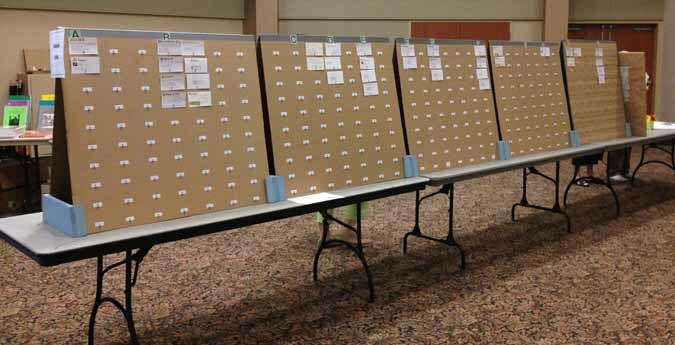 We rented multiple halls and rooms to support three simultaneous lecture tracks, individual consultations, books sales and the usual displays (surname cards, give-aways, pedigree chart lookup). 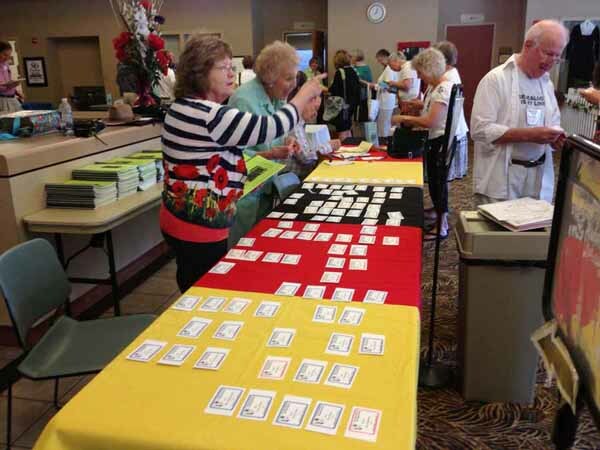 Registration table where an attendee obtains a badge and syllabus from Maryann Allen and Jane Kadie. Milt Kelly is registering walk-ins. sessions were managed by Shirley Riemer and Ingeborg Carpenter. Guest speakers introductions. 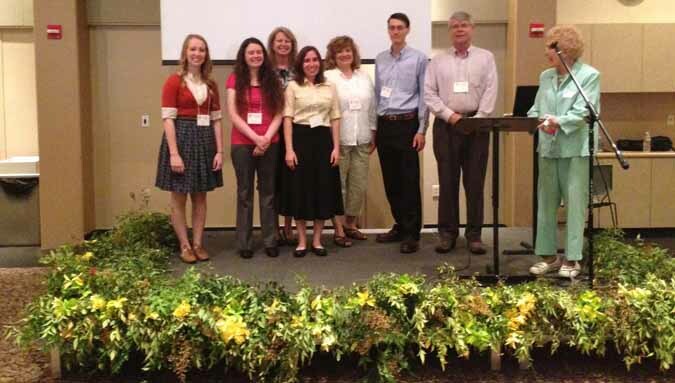 Left to right are Kelsee Jackson, Mary Koeven, Peggy Carpenter, Camille Andrus, Susan Sirrine, Bryce Rogers, Dr. Roger Minert and Jane Kadie. 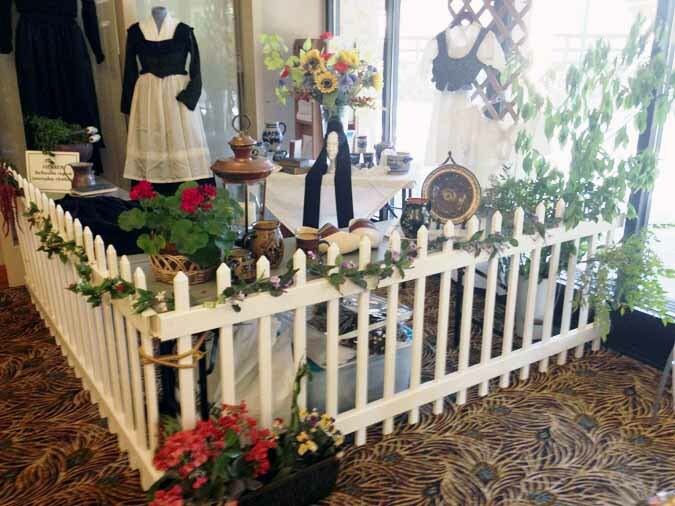 The greenery decoration was designed and installed by Diane Hubbard. Book and merchandise sales. Dr. Minert signed his books for purchasers. The most important of the the several lunch tables. Pedigree chart binders table next to pedigree charts volunteer Bob Boyer (left). 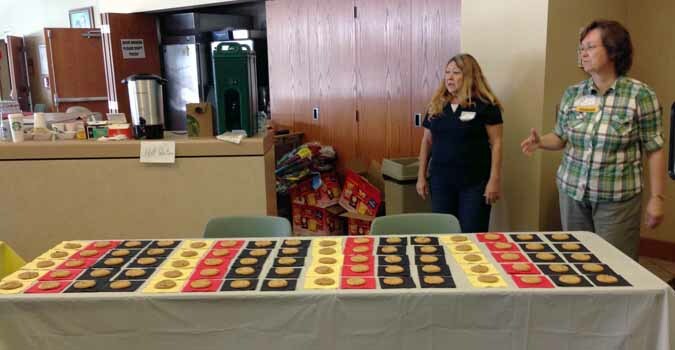 Freebies table (right). 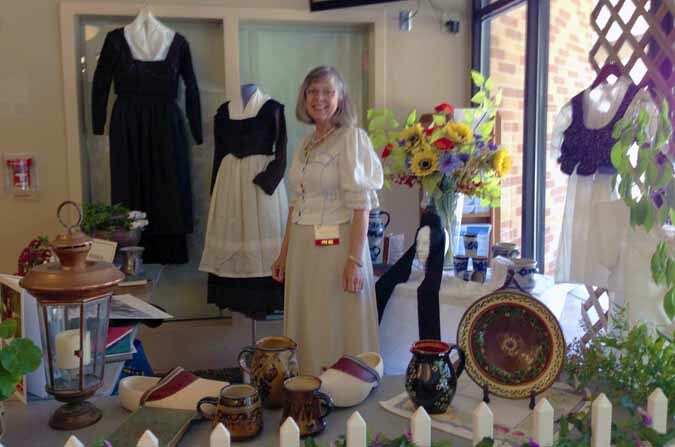 Ingeborg Carpenter standing in the German historical exhibit put together by her and Shirley Riemer. Topics: Three lecture tracks plus free individual consultations. This seminar was possible only because of the labors of the following dedicated volunteers (listed in alphabetical order by first name): Alex Shaw, Alice Morrow, Betty Jo Hansen, Bev McAmis, Bob Boyer, Charlotte Alexander, Denise Miller, Diana Kelly, Diane Hubbard, Eugene Poch, Ingeborg Carpenter, Jane Kadie, Joan Gunn, Liz Shaw, Maryann Allen, Milt Kelly, Paul Hodel, Phyllis Stewart, Rex Smith, Rick Hanson, Sally Spenker, Shirley Riemer, Susan Rogers, Virginia Kysh.